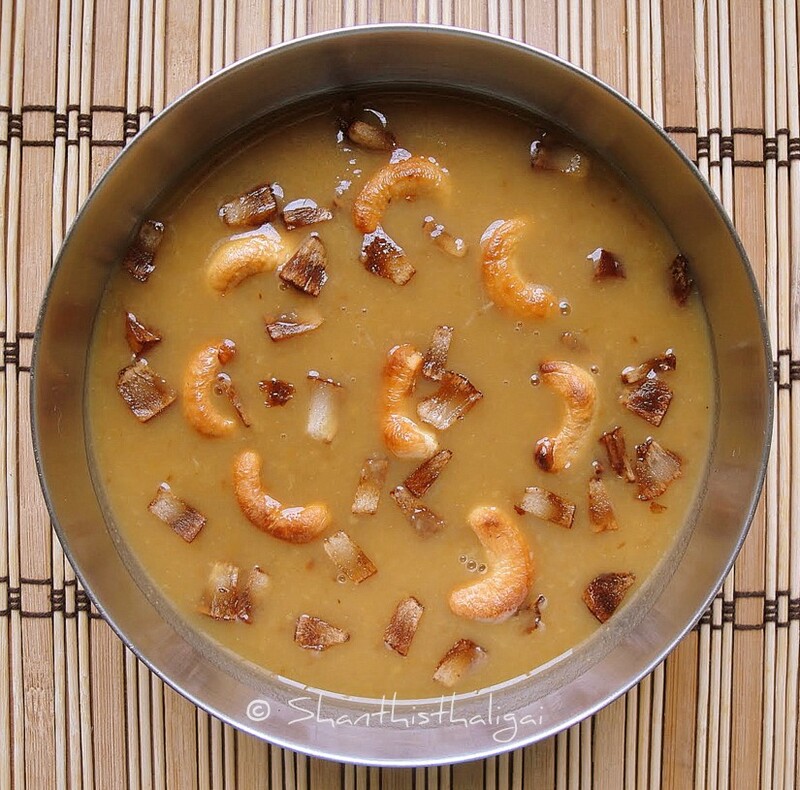 Vishu sadya or Onam sadya in Kerala, is incomplete without pradhaman and payasam. This classic pazham pradhaman / kheer is made with ripe bananas,coconut milk and jaggery. Cut nendrampazham into finger long pieces and steam cook until mushy. When cool, peel the skin, remove the seeds and small veins, and grind in a mixie to a smooth pulp. Do not add water. Dissolve jaggery in water, strain for impurities and keep ready. Heat a spoon of ghee in a uruli or thick bottomed kadai, fry coconut pieces until brown, and cashews until golden brown, drain and keep aside. In the same uruli, melt remaining ghee and add the banana pulp and stir continuously (stir continuously as the bananas will stick to the bottom) for about 3 minutes in medium heat. Now add jaggery syrup little by little, simultaneously stirring well without any lumps. Add dry ginger powder and cook in medium heat until the mixture thickens like a mass. Now add the 2nd extract coconut milk and cook on medium flame for 8 to 10 minutes. Stir occasionally. Switch off the flame and add thick 1st extract coconut milk. Mix well. Add cardamom powder, ghee fried coconut bits and cashewnuts and mix well. Pazham pradhaman / Nendrapazham Pradhaman is ready to be served. NOTE: Coconut milk extracts can be used more or less to get the desired consistency. Well explained.... Trying this for Vishu.